In the Internet usage example (Table 15.1). a paired test could be used to determine if the respondents differed in their attitude toward the Internet and attitude toward technology. The resulting output is shown in Table 15.15, The mean attitude toward the Internet is 5.167 and that toward technology is 4.10. 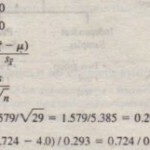 The mean difference between the variables is 1.067. with a standard deviation of 0,828 and a standard error of 0.1511. This results in a 1 value of (1.067/0.1511) 7.06. with 30 – 1 = 29 degrees of freedom and a probability of less than 0.001. Therefore. the respondents have a more favorable attitude toward the Internet as compared to technology in general. An implication. if this were a large and representative sample. would be that Internet service providers should not hesitate to market their services to consumers who do not have a very positive attitude toward technology and do not consider themselves to be technologically savvy, Another application is provided in the context of determining the relative effectiveness of IS-second versus 30-second television commercials. A survey of 83 media directors of the largest Canadian advertising agencies was conducted to determine the relative effectiveness of 15-second versus 30-second commercial advertisements. Using a 5-point rating scale (being excellent and 5 being poor). 15- and 30-second commercials were rated by each respondent for brand awareness. main idea recall. persuasion. and ability to tell an emotional story. The accompanying table indicates that 30-second commercials were rated more ‘favorably on all the dimensions, Paired tests indicated that these differences were significant. and the 15-second commercials were evaluated as less effective. Thus 15-second commercials may not be the answer marketers are looking for. Actually. today. the problem may not be how effective television commercials are. but whether the consumers actually will be watching the commercials. One in five users never watched a commercial in 2008. and there is a threat that this number will increase in the future. Heavy advertisers such as..General Motors will have to come up with more effective and creative ways to show their commercials. The difference in proportions for paired samples can be tested by using the McNemar test or the chi-square test. as explained in the following section on non-parametric tests. Non-parametric tests are used when the independent variables are non-metric. Like parametric tests. non-parametric tests are available for testing variables from one sample, two independent samples, or two related samples. The decision to reject the null hypothesis is based on the value of K. The larger the K is, the more confidence we have ‘that H is false. For« = 0.05 .the critical value of K for large samples (over 35) is given by 1.36/√n.18 Alternatively, K can be transformed into a normally distributed z statistic and its associated probability determined. In the context of the Internet usage example, suppose we wanted to test whether the distribution of Internet usage was normal. A K-S one-sample test is conducted, yielding the data shown in Table 15.1’6. The largest absolute difference between the observed and normal distribution was K =·~.222. Although our sample size is only 30 (Jess than 35), we can use the approximate formula and the critical value for K is 1.36/v’30 = 0.248. Because the calculated value of K is smaller than the critical value, the null hypothesis cannot be rejected. Alternatively, Table 15.16 indicates that the probability of observing a K value of 0.222, as determined by the normalized z statistic, is 0.103. Because this is more than the significance level of 0.05, the null hypothesis cannot be rejected, leading to the same conclusion. Hence, the distribution of Internet usage does not deviate significantly from the normal distribution. The implication is that we are safe in using statistical tests (e.g , the z test) and procedures that assume the normality of this variable. As mentioned earlier, the chi-square test can also be performed on a single variable from one sample. In this context, the chi-square serves as a goodness-of-fit test. It tests whether a significant difference exists. between the observed number of cases in each category and the expected number Other one-sample non-parametric tests include the runs test and the binomial test, The runs test is a test of randomness for the dichotomous variables This test is conducted by determining whether the order or sequence in which observations are obtained is random The binomial test is also a goodness-of-fit test for dichotomous variables. It tests the goodness of fit of the observed number of observations in each category to the number expected under a specified binomial distribution. For more information on these tests, refer to standard statistical literature. When the difference in the location of two populations is to be compared based on observations from two independent samples, and the variable is measured on an ordinal scale, the Mann-Whitney U test cart be used This test corresponds to the two-independent-sample t test for interval scale variables, when the variances of the two populations are assumed equal. In the Mann-Whitney U test, the two samples. are combined and the cases are ranked in order of increasing size. 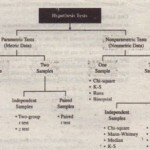 The test statistic, U, is computed as the number of times a score from sample 1 or group 1 precedes a score from group 2. If the samples are from the same population, the distribution of scores from the two groups in the rank list should be random. An extreme value of U would indicate a non-random pattern, pointing to the inequality of the two groups. For samples of less than 30, the exact significance level for U is computed. For larger samples, U is transformed into a normally distributed z statistic. This z can be corrected for” ties within ranks. We examine again the difference in the Internet usage of miles and females. This time, though, the Mann-Whitney U test is used. The results are given in Table 15.17. Again, a significant difference is found between the two groups, corroborating the results of: the two-independent-samples 1 test reported earlier. Because the ranks are assigned from the smallest observation is the largest, the higher, rank (20.93) of males indicates mat they use the internet to a greater extent than females (mean rank = 10.07). Researchers often wish to test for a significant difference in proportions obtained from two independent samples. As an alternative to the parametric z test considered earlier, one could also use the cross-tabulation procedure to conduct a chi-square test, this case, we will have a 2 X 2 table. One variable will be used to denote the sample and will assume the value 1 for sample and the value of 2 for sample 2. The other variable will be the binary variable of interest. 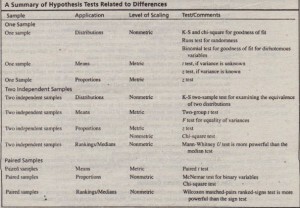 Two other independent samples non-parametric tests are the median test and Kolmogorov Smirnov test. The two-sample median test determines whether the two groups are drawn from populations with the same median. 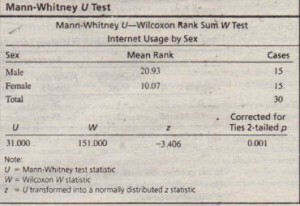 It is not as powerful as the Mann-Whitney U test because it merely uses the location of each observation-relative to the median, and not the rank, of each observation. The Kolmogorov Smirnov two-sample test examines whether the two distributions are the same, It takes into account any differences between the two distributions, including the median, dispersion, and skewness, as illustrated by the following example. How do marketing research directors and users in Fortune manufacturing firms perceive the role of marketing research in initiating changes in marketing strategy formulation? It was found that the marketing research directors were more strongly in favor of initiating changes strategy and less in favor of holding back than .were users of marketing research. The percentage responses to one of the items, “Initiate change in the marketing strategy of the firm whenever possible are given in the following table. Using the Kolmogorov Smirnov (K-S) test, these differences of role definition were statistically significant at the 0.05 level, as shown in the table. In this example. the marketing research directors and users comprised two independent samples However, the samples are not always independent. In the case of paired samples, a different set of tests should be used. An important non parametric test for examining differences in the location of two populations based on paired observations is the Wilcoxon matched-pairs signed-ranks test This test analyzes the differences between the paired observations, taking into account the magnitude of the differences, So it requires that the data are measured at an interval level of measurement, However it does not require assumptions about the form of the distribution of the measurements. It should therefore be used whenever the distributional assumptions that underlie the test can not be satisfied. This test computes the differences between the pairs of variables and ranks the absolute differences. The next step is to sum the positive and negative ranks. The test statistic, z is computed from the positive and negative rank sums. 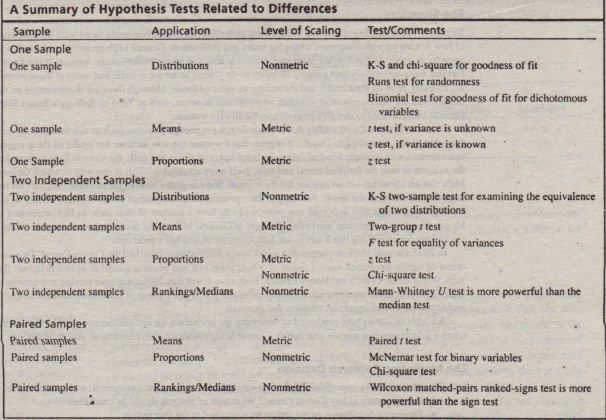 Under the null hypothesis of no difference, z is a standard normal variate with mean 0 and variance 1 for large samples. This test corresponds to the paired t test considered earlier. The example considered for the paired t test, whether the respondents differed in terms of attitude toward the Internet and attitude toward technology, is considered again, Suppose we assume that both these variables are measured on ordinal rather than interval scales, Accordingly, we use the Wilcoxon test. The results are shown in Table 15.18. Again, a significant difference is found in the variables, and the results are in accordance with the conclusion reached by the paired t test. There are 23 negative differences (attitude toward technology is less favorable than attitude toward Internet). The mean rank of these negative differences is 12.72. On the other hand, there is only one positive difference (attitude toward technology is more favorable than attitude toward Internet). The mean rank of this difference is 7.50, There are six ties, or observations with the same value for both variables. These numbers indicate that the attitude toward the Internet is more favorable than toward technology. Furthermore, the probability associated with the z statistic is less than 0.05, indicating that the difference is indeed significant. Stephen W. Sanger. CEO of General Mills is constantly faced with the challenge of how to keep up with consumers’ changing tastes and preferences. General Mills recently conducted thorough focus- group research on the most important consumers in grocery stores today women. It is a known fact that three out of every four grocery shoppers in the United States are women, and many of these women are focusing more on their health and the nutritious value of foods. Although there are many cereals on the market with the same amount of valuable vitamins and minerals, such as Total or Kellogg’s Smart Start, General Mills decided to design a product specifically for women. In 2007, General Mills, in partnership with Curves International, launched the Curves Cereal. This new cereal of lightly sweetened toasted flakes of whole grain rice and wheat is available in two delicious flavors, Whole Grain Crunch and Honey Crunch. Both have fewer than 200 calories per serving and contain at least 33 percent of the recommended amounts of whole grains and 2 grams of fiber. They also are an excellent source of several important vitamins and minerals. A telephone survey was conducted to determine the preference for and consumption of Curves and the relative importance that women attached to a cereal being nutritious, fast, convenient, and good tasting. 1. What is the relative importance of the four variables (nutritious, fast, convenient, and good taste) in influencing women to buy Curves Cereal? What type of analysis should be conducted? 2. Discuss the role of the type of data analysis you recommend in enabling Stephen W. Sanger to understand women’s preference for and consumption of Curves Cereal. 1. Advertising for Curves Cereal should stress which of the four factors? (based on non-metric data) are classified separately for distributions and rankings/medians. The next example illustrates the use of hypothesis testing in international branding strategy, and the example after that cites the use of descriptive statistics in research on ethics. Standardized branding with customized packaging for a well-established name brand will not lead to greater market share in the international market, Other factors remaining equal. standardized branding with customized packaging for a well established name brand will lead to greater market share in the international market. To test the null hypothesis, a well-established brand such as Colgate toothpaste, which has followed a mixed strategy. can be selected. The market share in countries with standardized branding and standardized packaging can be compared with market share in countries with standardized branding and customized packaging. after controlling for the-effect of other factors.A two-independent-samples test can be used.